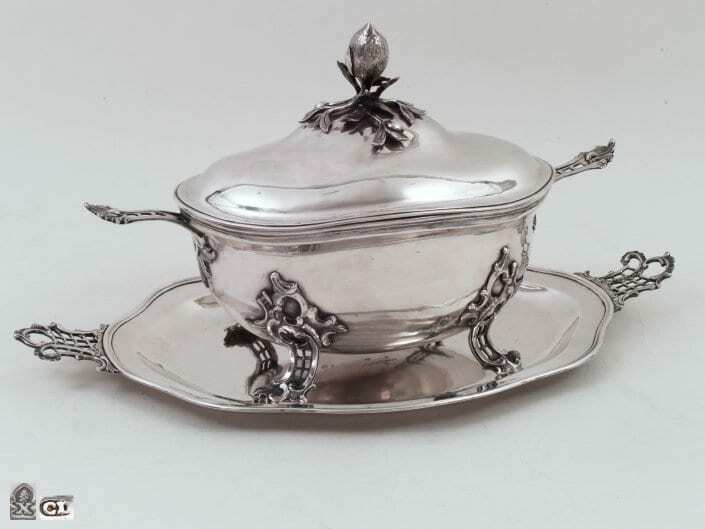 An antique silver tureen is a large bowl with a lid, very often with a platter, used to serve soups or other liquid food. It commonly has a removable insert or alternatively is gilt inside and was accompanied by ladles and large serving forks. The origin of the tureen remains unclear; its placing on a richly serviced table was and is in any case very important for a wealthy dinner. 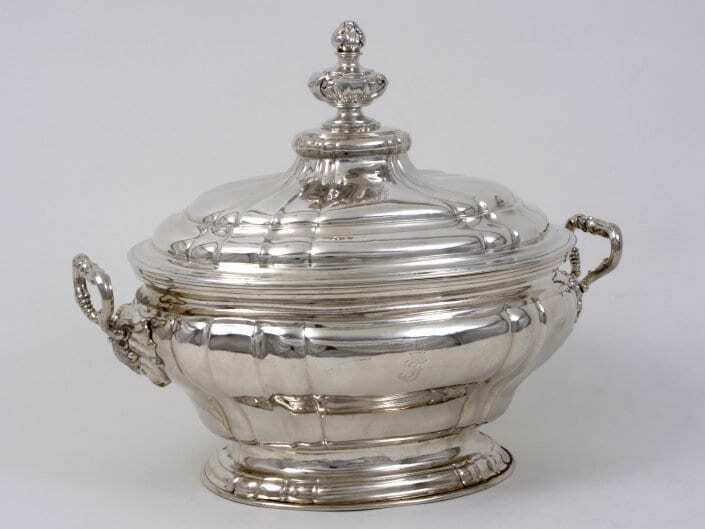 The tureen became popular during the early eighteenth century. 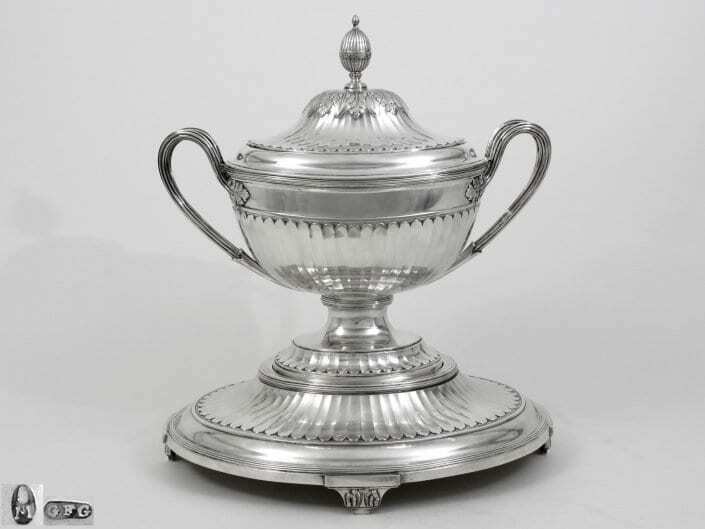 There is a variety of types; silver soup tureens, silver tureens for serving stew and many others. 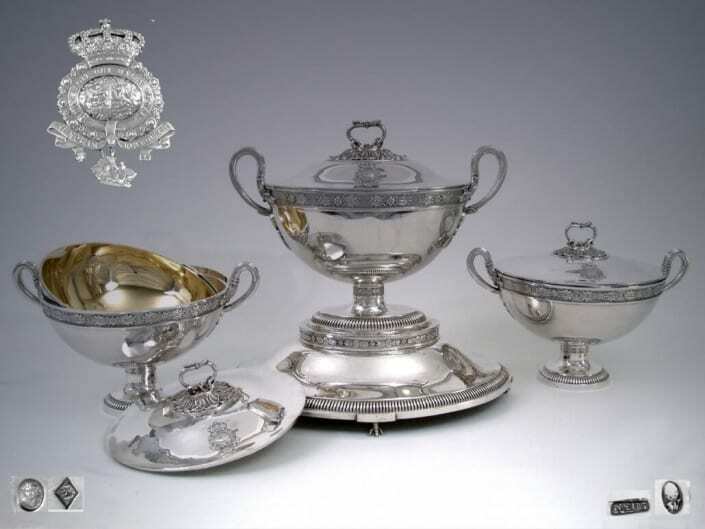 Royal Silver Ensemble: Two French Tureens made in Paris in 1798/1809 by Henri Auguste and a German Tureen with Stand made in Augsburg in 1811 by Johann Georg Christoph Neuss. From the property of Ernst August I, King of Hanover. 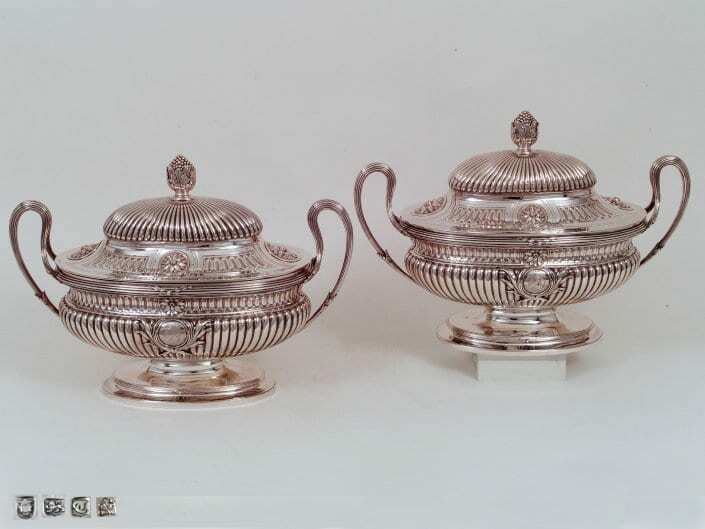 Pair of silver George III covered tureens with liners with vase-shaped bodies raised on spreading bases. Their overall work suggests the design of or inspiration by the architect Sir William Chambers. Made in London 1774/5 by John Parker I and Eduard Wakelin. riedrich Franz was the son of Ludwig, Duke of Mecklenburg-Schwerin (1725-1778) and Charlotte Sophie, Duchess of Sachsen-Coburg-Saalfeld (d.1810). He married Luise, Princess of Sachsen-Gotha-Roda (d. 1808) on 31 May 1775. This silver, rococo, mid-sized, eighteenth-century tureen was made by Christian II. Drentwett, a member of a well-known, old family of goldsmiths in Augsburg. Neoclassical silver soup tureen on stand, with a gilt-inside liner of great quality and monumental proportions. Made in Augsburg 1801 by Gustav Friedrich Gerich. 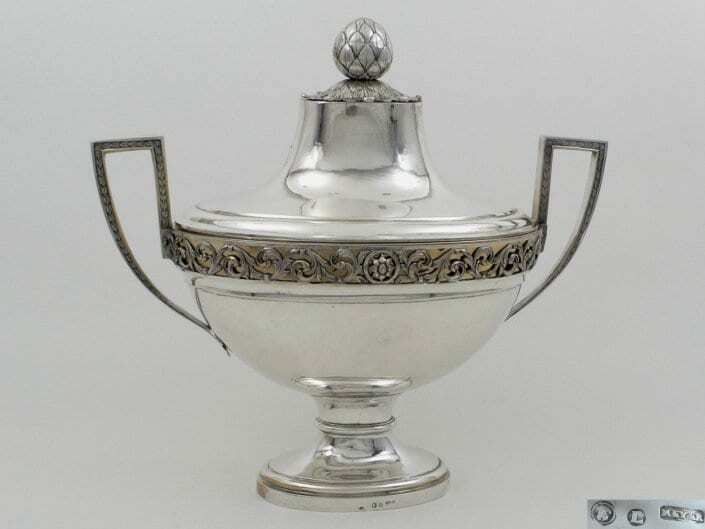 Antique silver, German soup tureen from Wroclaw from the late 18th century. Made in the neoclassical style, by the master maker Tobias Meyer.